Ann Barnes says the lack of a free mailshot will make it difficult for independent police commissioner candidates to get their message to voters. The police minister, Nick Herbert, has warned that a free mailshot for all voters in November’s first elections for police and crime commissioners will cost £25m-£30m. His warning came in response to a protest by a group of independent candidates that the rules on the elections are biased in favour of the political parties. The row over the conduct of the elections follows last week’s rulings that candidates with past juvenile convictions up to 50 years old are barred from standing, and that magistrates must resign from the bench if they are elected as commissioners. 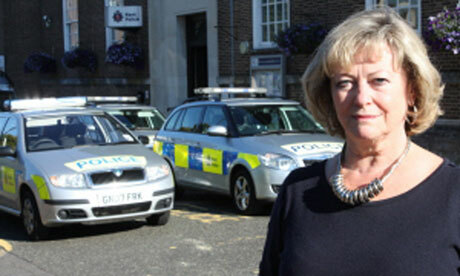 The protest at Downing Street and parliament on Tuesday has been organised by Ann Barnes, the chair of the Kent police authority for the past six years, and other independent candidates from Thames Valley and Sussex, who say the lack of a traditional free mailshot to every voter will make it difficult for them. “It’s quite perverse because we have the prime minister, the policing minister and the home secretary on record saying they want highly visible, strongly credible independent candidates to stand,” said Barnes, who is to hand in a protest letter to Downing Street. She said that without a state-funded mailshot those representing political parties had an unfair advantage because they had more money and resources to run their campaigns. So far, 41 independent candidates have declared their intention to stand in 16 of the 41 police force areas in England and Wales. They include eight candidates from the English Democrats and the English Defence League, as well as former magistrates and police officers. The Electoral Commission warned in March that, as a result of the government’s decision, up to 7 million people who did not use the internet could be disadvantaged. The former deputy prime minister Lord Prescott, who is standing as a candidate in Hull, described the move as scandalous. “In my area of Humberside that will mean 170,000 people, mostly elderly, will be denied their democratic right to information on the candidates,” he told the Lords. But the police minister told the BBC there would be a single national website with the details of every candidate’s election address. Those who wanted to be sent a printed copy would be able to ring a helpline to request it. Herbert said he anticipated that several hundreds of thousands of voters would apply for printed copies of the election addresses but the £25m-£30m cost of posting them to every voter could not be justified “in the current climate”. He said the success or failure of independent candidates would not turn on whether or not they had a free mailshot but on their use of the media, including new media, to capture local attention. The police minister repeatedly refused to set a benchmark for the turnout for the elections, which critics fear will be hit by voter apathy and poor quality candidates.